So you have some cellulite and decided it’s time to do something about it. You search on the internet a little or talk to a friend and decide using a cellulite cream is the way to go. After seeing literally dozens of different products, you’re confused more now than ever and have NO idea which one you should try or what ingredients should be in them. We’re going to take a minute to list 9 different ingredients that have been shown to help reduce the appearance of cellulite when used in a topical cream or lotion. While a good cellulite cream doesn’t have to have all 9, it should contain at least a few of these. Before we get to the list, keep in mind there’s no such thing as a “miracle” cure for cellulite. They don’t work overnight and definitely aren’t a “permanent” cure for cellulite (nothing is!). Cellulite is a complex condition that requires a number of different lifestyle changes and products to treat effectively. And while a good cellulite cream is part of that treatment, be sure to keep your expectations in check and be patient. 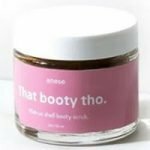 Ok so now that we got that out of the way, let’s take a look at some ingredients that we think have value when it comes to treating and minimizing the appearance of cellulite. 1. Caffeine– a member of the methylxanthines family, caffeine is thought to increase circulation and promote lipolysis of fat cells. While drinking too much coffee is actually bad for cellulite development, used topically it can be very beneficial. 2. Retinol– a derivative of vitamin A, retinol does a lot of great things for your skin. Around for the last 40 years or so, a ton of clinical studies have shown the effectiveness of retinol cream on wrinkles and skin. As a cellulite treatment, a 0.3% concentration applied twice a day for 6 months has been shown to improve the appearance of cellulite. It works by increasing blood flow and thickening the dermis. 3. Vitamin C– studies suggest this important vitamin is crucial to collagen synthesis and has anti-inflammatory and anti-oxidant properties. 4. Fisetin and Frambione– These two ingredients, derived from strawberries and raspberries, have been shown to aid in lipolysis (fat burning). They also have strong anti-inflammatory and anti-oxidant qualities. 5. L-Carnitine– this amino acid found naturally in the body is thought o help with fat burning and strengthening of skin cells. It can be taken as an oral supplement but is also found in a number of popular cellulite creams. 6. Euglena Gracilis and Glaucium Flavum Extracts– when combined with caffeine, these substances have been shown in clinical studies to help the body shed adipocytes (fat cells). Users reported some pretty encouraging results in reducing the appearance of cellulite. 7. Centella Asiatica– also called gotu kola or tiger’s herb, this has been shown to increase blood flow and allow for better absorption of nutrients. Interestingly, injured tigers rub against this plant to help speed healing (that’s where it got its name). 8. Horsetail Extract– this plant works mainly as a powerful anti-inflammatory when used in topical applications like lotions and creams. 9. Peptides– these are amino acids that serve as the building blocks for collagen and elastin. Those are the things that make up the connective tissue in your skin that becomes weakened and allows for cellulite to show. Research is still ongoing when it comes to peptides but early results look promising. So there’s a good starting point for some ingredients you may want to look for in any cellulite cream you’re considering buying. Now, these aren’t the only ingredients that have value in treating cellulite. And you don’t necessarily need every one of these in whichever cream you chose. But these are a good starting point and at least have some studies that back up the claims! Click here for our list of the 10 best cellulite creams that contain these ingredients.